City Councillor for Gloucester-South Nepean. I know that the CBET worked diligently to organize the fund raiser and I want to commend you for your efforts to empower students in Bangladesh by providing them with scholarships to receive an education. I hope that you and the other organizers take pride in all that your initiative has accomplished to date. I am certain that the students will appreciate your generosity for years to come. Not only in your community, but throughout the country, I have always felt that education is a great equalizer and enables each and every one of us to reach our potential. I would be delighted to attend and donate at future events, so please keep me in mind, should this be of interest. Besides providing financial assistance to financially needy but academically bright students as it’s primary mission, CBET has expanded it’s role in assisting other organizations which are serving for humanity. In July 2015 when Odawa Native Friendship Center which provides three hot meals a day, computer training, crisis and transition counselling, laundry facilities and a warm place to get shelter during the day for homeless members of our Aboriginal community, was about to close it’s doors due to funding cut from City of Ottawa, CBET board of directors came forward and donated with their personal fund for the full cost of operating the center for one full day so this organization can continue it’s operation in serving the humanity. With the help of many other organizations like CBET the Center is now fully functional as it was before. Investment in knowledge pays the best interest. 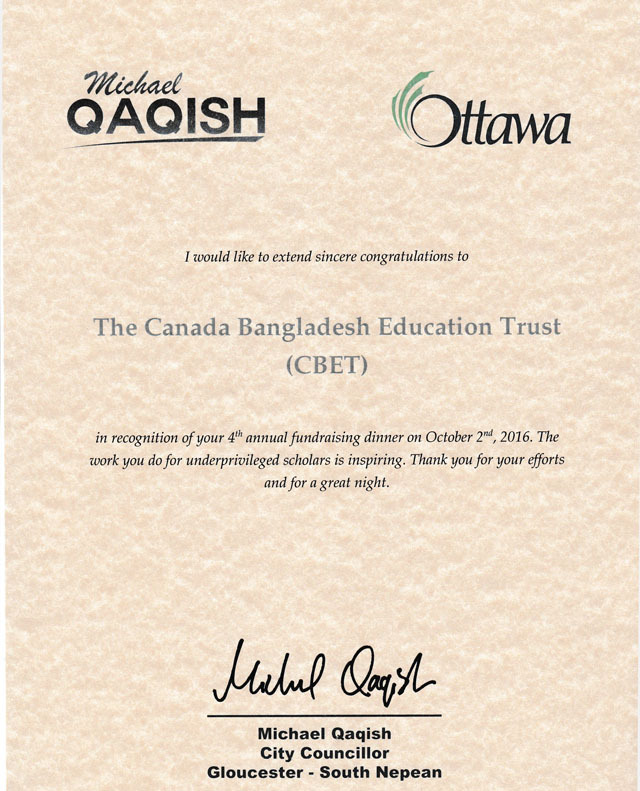 I believe, CBET members and supporters will get the best reward from Allah for their investment in education/for your support to promote education in Bangladesh. You are doing an excellent job. May Allah reward you all. Former Judge in Bangladesh. Now residing in UK. Thank you very much for organizing such a wonderful event with huge community participation, it was indeed a successful one. As an invitee/ participant and community member, we all witnessed your hard-work towards this successful ‘Pitha Utshab’. Thank you! Participants of the Pitha Utshab event. You are doing an amazing job for our people in Bangladesh. You are leading by example and ahead of others. This is a great cause. May Allah place barakah in your intentions and work.